This year’s competition is a science education facility in Tiburon, California. Student registration is free. Register for updates. The competition challenge is to create a zero net energy bayside community education and visitor’s center, in support of the mission of the Romberg Tiburon Center for Environmental Studies (RTC). This facility is San Francisco State University’s center for estuary and ocean science located on 53 acres of bayside property in Tiburon, California. Click here for Competition Program, Zero Net Energy Considerations, Design Documentation, and Submission Requirements. The registration deadline is January 10, 2018 at 1:00 PM PST and the submission deadline is January 30, 2018 at 1:00 pm PST. Students must complete the registration form. 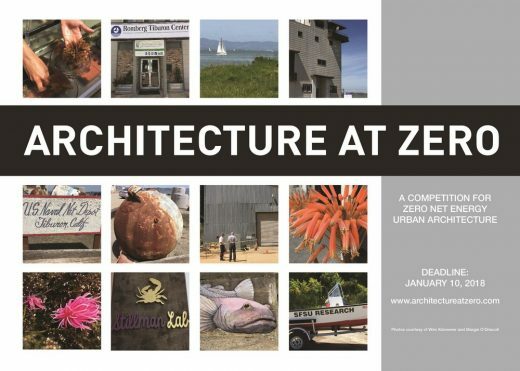 Please note that the Architecture at Zero competition uses an electronic registration process. If you are submitting multiple projects, you will need to register each project separately. June 26, 2017 in Competitions.